Birthmark is the term used to describe any of the large number of common skin marks that are present at birth or appear soon afterwards. It doesn’t mean they were caused by the physical process of birth. Birthmarks generally result from an overgrowth of a structure that is normally present in the skin. For example, an overgrowth of blood vessels produces vascular birthmarks or haemangiomas; an overgrowth of pigment cells produces congenital naevi or moles. 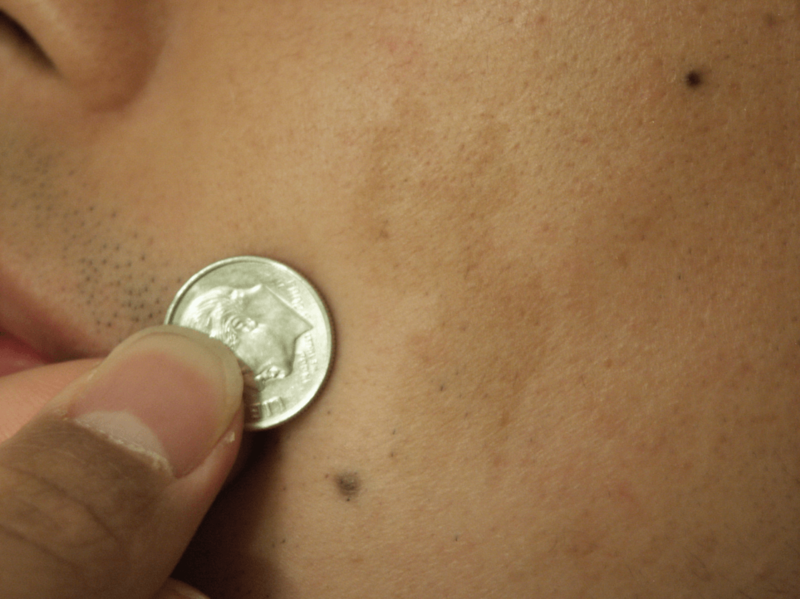 There are a number myths and superstitions about birthmarks. Moles were considered evidence of guilt during the Salem Witch Trials. The “maternal impression” myth suggests that if a woman experiences an especially strong emotion during pregnancy and touches a particular location on her body, her baby may be born with a birthmark on that part of her baby’s body. The reality is that the cause of birthmarks is unknown. For most babies they don’t create major problems and many birthmarks do not require any treatment. They do not predict future prosperity or special personality traits. They are not caused by the actions or omissions of the pregnant mother. Fortunately lasers and other medical breakthroughs have provided options for those birthmarks that do not fade spontaneously and are problematic or unsightly. Café au lait macules are pale brown or milk coffee-coloured birthmarks. They can occur at any site on the body, are usually less than 5mm in diameter and are not dangerous or harmful. Café au lait macules are usually present at birth but may occur later in childhood or increase in number with age. Treatment is generally not required, however, if there are multiple larger lesions, the child should be seen by a dermatologist to look for evidence of neurofibromatosis (a genetic condition that carries a high risk of developing a tumour). Lasers can lighten Café au lait macules and improve their cosmetic appearance. A congenital melanocytic naevus or congenital mole, is a harmless growth of the pigment cells that may be present at birth or appear within the first few months. Congenital naevi can occur at any site on the body, vary in size from several millimetres to several centimetres and may be flat or raised. Congenital naevi can turn into melanomas, but for congenital melanocytic naevi smaller than 5 cm in diameter the risk is very small and nothing needs to be done about most of them. If there is unexpected growth or change, they can be surgically removed. Once the child is old enough to cooperate excision can be performed to improve the cosmetic appearance. Giant congenital melanocytic naevi are a risk factor for skin cancer. Long-term follow-up of these lesions is essential to detect and treat any development of skin cancer as early as possible. 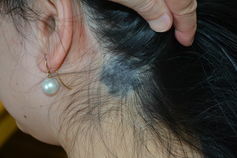 Mongolian spots are blue-brown stains that may look like a bruise and are usually present at birth over the lumbar spine, buttocks, side of the body or shoulders. They are more common in Asian children. They often fade naturally over time. They generally do not require any treatment, however lasers can be used to lighten Mongolian spots and improve their appearance. An haemangioma, or strawberry naevus is a raised or oval dome shaped vascular mark that may occur at any site on the body. One or more strawberry naevi appear some weeks after birth. It grows rapidly over three to six months to form a bright red raised soft area which can vary in size from half a centimetre to several centimetres. Up to 10% of infants may develop these haemangiomas in the first year. The sooner they are treated the better. This can be done with laser, propranalol or a short course of cortisone, prescribed by a doctor, taken by mouth. 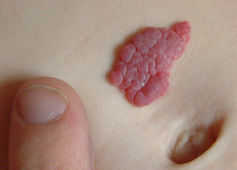 Untreated, most haemangiomas eventually shrink and disappear. However before they disappear they may grow rapidly, ulcerate or interfere with the eyes, nose, or mouth. Some may ulcerate or bleed. While frightening at the time, this is rarely life threatening and can usually be managed with dressings and by applying pressure to the area. If small, bleeding haemangiomas can be excised. A port wine stain is a blood vessel malformation composed of expanded thin walled blood vessels. It produces a persistent, flat, clearly outlined red birthmark on the skin. Port Wine stains are present at birth in up to 2% of children. Initially the affected area is flat and pale pink. Rather than fade over time like many birthmarks, port wine stains become darker, raised and rough as the child grows. Any site may be affected but port wine stains most commonly occur on the head and neck. Port Wine Stains may be single or multiple, vary in size from a few millimetres to many centimetres in diameter. Port wine stains can have a significant psychological effect on children. Port wine stains on the face, especially if treated early will respond well to laser. Multiple treatments may be required. Adult port wine stains can also be treated, but tend to require more treatment sessions than children’s. 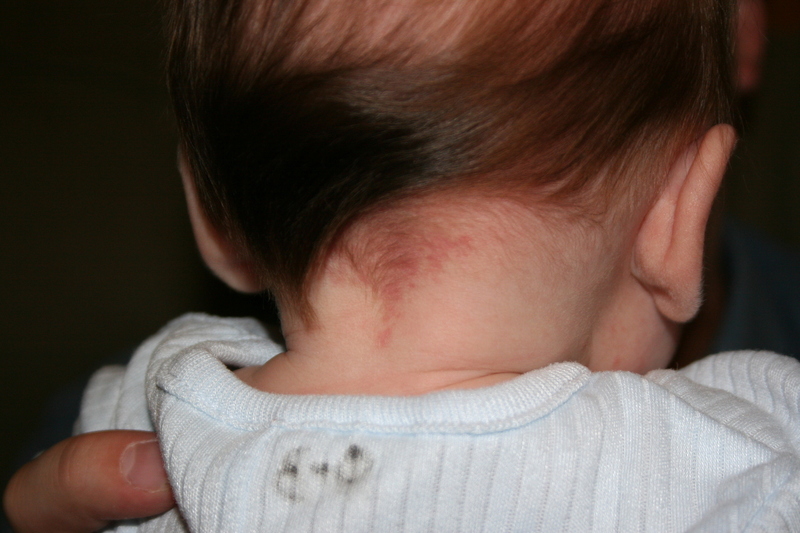 The salmon patch or stork bite is the most common vascular mark found at birth. It is a pale red or pink flat mark on the forehead, upper eyelid, upper lip or at the back of the neck. They occur in up to 50% of children. Most salmon patches on the face disappear within two to five years. Those on the back of the neck tend to persist, however they become hidden once the scalp hair grows. Treatment is not usually required. Salmon patches on the forehead may become more visible with crying or activity. If salmon patches persist, vascular lasers can be used to lighten their colour.